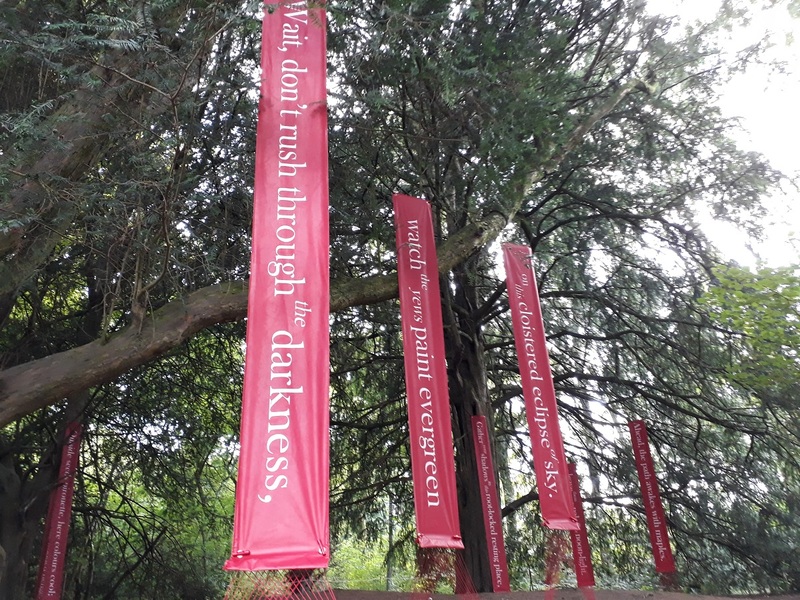 Hallowed is poem 5 on the Westonbirt Arboretum Autumn Trail 2017.
on this cloistered eclipse of sky. winds hush within the wooded henge. leave them to pale in the noon-light. Ahead, the path awakes with maples. This ring of six yews creates a shelterbelt; you feel enclosed in this shaded evergreen. I wanted this poem to be about how sanctuary is not always light. In darkness, we find light. I believe that the trees know our darkness. Dealing with darkness is about being and waiting. My theme for this poem tied in with what I found out about yews from my research. For thousands of years, yews have been associated with immortality, death and rebirth. Native to Britain, yews can live for over five hundred years and some, like 'The Fortingall Yew' in Perthshire, are said to be two thousand years old. However, it is hard to date the yew as the trunk hollows with the years and so you cannot count the concentric rings. One of the oldest surviving objects is a spearhead made from yew wood. It is 450,000 years old and was used by homo erectus in Clacton-on-Sea! Yew wood is strong and pliable and was used to make longbows. Eighty percent of yews in the UK are found in churchyards; churches were often built around the yews. It is said that yews were planted on the graves of plague victims to protect and purify the dead. Myths link it to Christ’s cross and yew branches used to be carried on Palm Sunday and at funerals. In Northern Spain, on All Saints Day, branches of the yew tree are taken to the graves of the recently deceased so they can find their way to the Land of Shadows. Druids also worshipped among yews and used them as burial sites for their tribal leaders. Hence the line in the second stanza “Gather your shadows in this root-locked resting place”. Also the yews appear to be in a circle and pillared as if in a henge: “Winds hush in this wooded henge” -a place for inner worship Druid wisdom from the yew teaches that out of death, renewed life emerges. This association of the yew and rebirth comes from how the yew can re-root itself from its branches. The religious connections of the yews gave me the poems title 'Hallowed'. The Latin name for yews is Taxus baccata and the word 'toxic' is from the root taxus. Every part of the yew, except for the fleshy red aril, is poisonous, even the black seeds within the red aril are toxic; this is the reason yews are often omens of doom. One of the Celtic kings, Cativolcus, poisoned himself with yew rather than submit to Rome and in Shakespeare’s Macbeth, the three witches make poison with “slips of yew, silvered in the moon’s eclipse.” For this reason yews were used to protect graveyards from cattle as cows would die if they ate the leaves. “sacred churchyard queen” – Sheena Blackhall, The Fortingall Tree. “of vast circumference … Death, the skeleton, and time the shadow.” – Dr Sheeba Azhar,Toru Dutt. “The trees of the mind are black... separated from my house by a row of headstones… the yew tree points up, it has a gothic shape… the message of the yew tree is blackness, blackness and silence” – Sylvia Plath, The Moon and the Yew Tree. “cheerless unsocial plant that loves to dwell midst skulls and coffins, epitaphs and worms where light-healed ghosts and visionary shades …” – Robert Blair, The Grave. The evergreen backbone: In autumn it is easy to overlook the trees that just carry on carrying on. But many of these are incredibly important to Westonbirt – including these native yews (Taxus baccata). Many of our largest yews date from the mid-nineteenth century, when Robert Holford planted them to provide the structure and shelter he needed for his more ornamental specimens. Over time some have become rather ‘leggy’ and we are now cutting these back to recreate the bushy backdrop Holford intended. This process has to be done slowly to prevent shocking these mature trees. First we reduce the canopy and remove lower branches to let more light into the trunk below. This encourages new shoots; once the trunk has ‘greened up’ we can remove the top entirely.